A picture board game for 2 or more players. 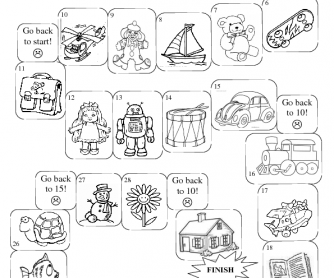 First introduce and practice the used vocabulary with the children and let them colour the pictures. Then the players take turns to throw the dice and move their counters from the start around the board. They have to name the object in each sguare they lend on and follow the instructions. If they do not know the English word, the other players can say it and the player loses one turn.